The plaque names soldiers who died serving in India from 1819 to 1838. It will be displayed at Nottingham castle. Most of the regiment of 800 men, as well as many of their family members, died during the posting due to illness. 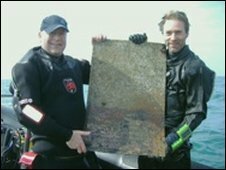 Mr Smith, of Tunbridge Wells in Kent, who uncovered the plaque in August, said: "When you go diving you go into history and when you find something as significant as this you realize it has to be done."